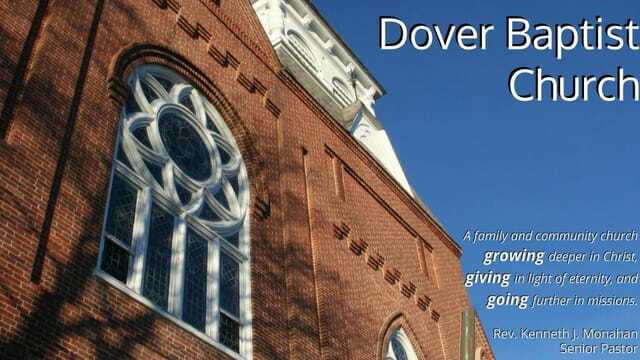 Welcome to Dover Baptist Church! We are really happy you have joined us today! If you are new here you might be interested to know that we have a nursery available on the 1st floor. We have an elevator on the main ground floor, which can take you to the 2nd floor sanctuary. There is a children's church program, held in the basement classroom, during the service. Our worship leader will announce the time each week. We usually have a time of community greeting near the beginning of our worship service. Near the end of the service, after the message, we have our time of offering please give as you feel led to. If you are new or visiting Dover Baptist Church we want you to feel welcome! We would also love it if you would return each week.To help us connect with you would you consider either filling out one of the visitor cards, located in the seat back pocket near you, or dropping us a line on-line from our website. Please enjoy the service. Join us in the Chapel, at 3:00 p.m., for a Monday bible Study. Our seniors ministry, called "Maranatha" and it meets each Tuesday at 9:30 a.m. here at DBC. If you are 50+ you are welcome to join them. They meet in the main fellowship hall on the ground floor. If you have kids aged 3.5 through 6th grade then we have a class for you. Join us each Tuesday starting at 6:30 p.m.! Join us at 7:00 p.m. in the 2nd floor conference room for an open bible study. If you are between 7th and 12th grade then you are welcome to come to DBC each Saturday night from 6 to 8 p.m. for an action packed night of games and studying. Please check doverbaptistchurch.org > Connect > Calendar for full details. Join us Friday evening, 19 April, at 7:00 p.m. for our Good Friday Service. We hope you will join us at Henry Law Park at 6:30 a.m. on Easter morning for our "SonRise Service." Following that, at 8:00 a.m., we will gather here at the church for an Easter Breakfast. At 10:30 a.m. we will be celebrating our risen Savior during our Easter Worship Service. Palm Sunday Message: A Time to Weep?